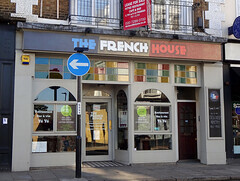 The French House was a French cafe/restaurant in Crystal Palace, on the North side of the triangle. It has now closed photo of notice. French cafe/restaurant in Crystal Palace, on the North side of the triangle. The decor is themed around the '60s French yé-yé music scene, with 7" records, posters and murals on the walls. Seating comprises large wooden benches and tables. French patisserie and breakfasts are served until midday, when the menu switches to a mixture of small plates (bread, pâté, cheese, charcuterie), larger meals, and raclette/fondue for sharing. The wine list is entirely French; they also serve cocktails. Kat visited on a Wednesday lunchtime in June 2017. It was fairly empty, with three other customers (one of whom seemed to know the owner) and two friendly dogs. Music was playing quite loudly (a mixture of chanson and yé-yé, as one might expect — Marie Laforet's French-language cover of "Paint It Black" was a highlight). A goat cheese and lavender honey salad (£10.50) was pretty good, with a substantial slice of grilled goat cheese and plenty of variety underneath it: lettuce, tomato, olives, walnuts, grapes and apple. A latte was £2.70. Service was friendly and efficient — a glass of ice water was immediately provided (it was a very hot day). Accessibility: A low step to get in. The rear of the restaurant is down a couple of steps. Toilets are down a flight of stairs with one turn midway, with a handrail on both sides. Child friendliness: High chairs are available on request. There is a baby change room downstairs, separate to the toilets. Note that the website auto-plays video. Last visited by Kat, June 2017. Last edited 2018-09-09 11:21:17 (version 3; diff). List all versions. Page last edited 2018-09-09 11:21:17 (version 3).